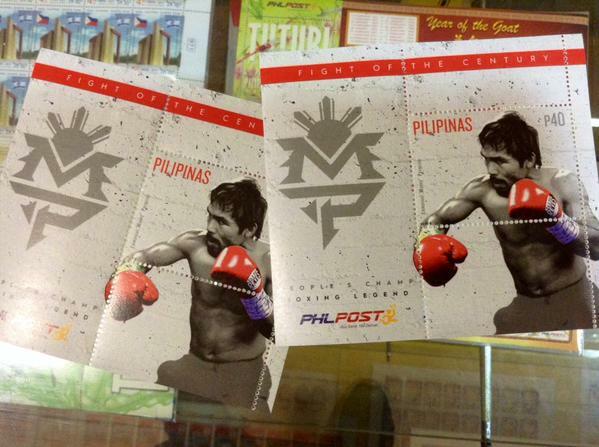 Picked up these Manny Pacquiao commemorative stamps at the post office yesterday. There are two versions -- the smaller one that costs P10 each but sells by a whole sheet for P400 and this larger one that fetches for P40. I haven't collected stamps since I was a kid because of my grandfather who got me got me into that hobby. I cannot remember when I stopped collecting or even what happened to that collection. But when I got this pair of stamps, I thought of him. And I smiled. Signposts. The San Beda Red Lions survived a scare from the Perpetual Help Altas who missed a bunch of free throws (seven to be exact) in the endgame. SBC took the match, 83-81, to go to 5-1 while UPHSD fell to 4-2. It was a game that had all the feel of a playoff match. But through it all, both squads displayed great sportsmanship. Earl Scottie Thompson, the reigning NCAA MVP, played the entire match (although it says officially he played 39 minutes) but I believe that fatigue caught up with him as he missed five of those seven free throws that nearly flipped the script for them. As he flubbed a chance to cut the lead to two and hope for a put back off an offensive rebound, the Red Lions and their coach, Jamike Jarin, all tropped to the far end of the court to cheer up a disconsolate Thompson. Terrific display of sportsmanship between the two squads. Of the Bedans, I'll give massive props to Dan Sara, Art dela Cruz and Ola Adeogun who epitomized sportsmanship. As Thompson agonized over a botched FT, Adeogun came over to tap his hand; a gesture reserved only for teammates. That was a cool moment. I was a proud spectator to this. Growing confidence: The JRU Heavy Bombers after a slow start are finding their groove. With the wins come the smiles. The first quarter saw both squads change leads several times. It took JRU a while to get execute their plays as they were missing points, some of them point blank stabs. CSB meanwhile was playing solid defense. But that will only get you so far when you can’t put points on the board. With Raphael Nayve and Jonathan Grey unable to get going because of some terrific defense on them and poor play between themselves, the Blazers crumbled. Fons Saavedra and JR Ongteco did their best to keep their side in the game but the rest of the team hardly did anything. That’s going to be difficult when you go up against a squad like JRU that runs precise sets and keeps to their system. If JRU can run they will. If there is no opportunity to run they either pound it inside to Abdel Poutouchi or look for Teytey Teodoro or Paolo Pontejos to score or create. They run different sets depending on whether it is Poutouchi or Abdul Abdulwahab inside. How did they get this win to give them a 4-2 record? Option 1: Give the ball to Poutouchi who posts up with his back to the basket. He spins to his right for a pull up shot, a hook or a drop pass to Darius Estrella (or John Grospe or Jordan dela Paz) who cuts from the baseline. Option 2: If the defense on Poutouchi is resolute, he will wait for Estrella to cut to the opposite side for either a hand off and an open shot or Teodoro will quickly cut from where he is stationed outside the arc for a bounce pass and a layup. Option 3: Mark Cruz throws the ball in from the top of the free throw line to either Poutouchi or Abdulwahab. Sometimes, if it is Gio Lasquety or even Marco Balagtas in the position, they will throw a floater or attempt a jumper. JRU head coach Vergel Meneses sprung his trap around the eight-minute mark of the second period. 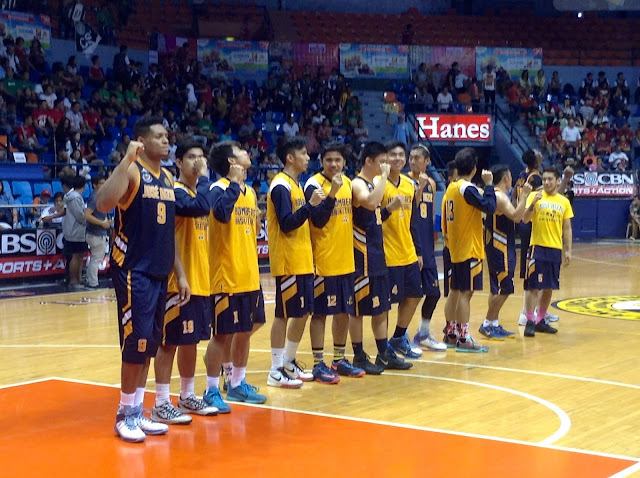 The score was 18-15, JRU at that point. From the time that Saavedra turned the ball over at the onset of the press, the Heavy Bombers fed off the turnovers and uncorked a crippling 21-7 run that all but ended the game. Surprisingly, JRU gave up the press at the start of the third and that sort of surprised CSB as the Heavy Bombers opened with an 8-2 spurt. When CSB tried one last rally in the fourth, JRU sprung their press again and that ended the Blazers’ threat. JRU doesn’t have the best rim protectors but they do play stifling defense. Abdel Poutouchi didn’t have the best game as he finished with seven points and five rebounds because of the double and triple teaming that he saw. He did manage four assists though. Even Abdulwahab dropped a nifty dime to a baseline cutter. Only Gio Lasquety and Darius Estrella failed to score a point. But they chipped in through some other stats. While Paolo Pontejos is oft in Meneses’ doghouse (I feel the former is underappreciated but gets chewed out for drifting into a me-first mode). I like how Meneses has shown faith in power forward Mark Cruz who he starts and in the last two matches – both of them wins – sends his player in with six minutes to play. And Cruz finishes the game. He can play good defense. He can pass and can score too. He just has to make better decisions inside on whether to tap the ball to himself or to a teammate and not picking up his dribble when he crosses halfcourt. Twenty-one points! Eight rebounds with two assists and three steals (minus two turnovers) in 26 minutes. Talk about efficiency and effectiveness. AS JRU struggled to put points on the board at the start of the game, he was there. Come the third period, he scored the first three baskets for JRU. When CSB tried to rally, he doused their fire. The lad just gets better and better. What must CSB do to get back on the winning track? Ongteco must be more consistent inside. He has to realize that throwing jumpers from the outside isn’t going to help. The rebound disparity was terrible – 42-26, JRU. How are you going to win when you’re getting beaten on the boards? The result? Only two second chance points. Christian Fajarito could help. He just needs to be more discriminating in his shots and start off my playing defense. Saavedra must cease giving up silly fouls because he is too an important player to be sitting on the bench. While it Grey needs to score, he along with Nayve must create for their teammates. That should make life a little easier for them. They do not have any interior defense so they should deny that entry pass. Rather than settle for outside shots, they should attack that basket. This appears in the Monday, July 27, 2015 edition of the Business Mirror. In 2004, publishing house Simon & Schuster released Washington Post writer Michael Leahy’s myth-shattering book, “When Nothing Else Matters” that chronicled the third and last comeback attempt by Michael Jordan only this time not with the Chicago Bulls but with the Washington Wizards. The title was taken from a relentless personal pursuit by Jordan to reclaim the top of the basketball firmament no matter who gets stepped on. While I agree with Simon Barnes of The Times of London that the author was committed to depicting Jordan as shameful, Leahy nevertheless expounded on that narcissistic and difficult side of Jordan that was first revealed in Sam Smith’s ground-breaking “The Jordan Rules.” The GOAT’s Hall of Fame speech did nothing to rebut that and that left me shaking my head in disgust. My remark then was, “If the shoe fits…." I guess people will always disappoint someone (as I am sure I do with others). A couple of days ago, I saw this Tweet that sort of summed a collective shock over people who were at least a part of our childhood. Tweeted Jon Richard from London, “Cosby allegations. Hulk Hogan getting scrubbed for racism. What else could ruin my childhood?" Perhaps you can even throw in ESPN radio personality Colin Cowherd (although I cannot say that he is an influence on me or a staple of my sports-diet). Make that ex-radio personality after he was axed for comments about people from the Dominican Republic. 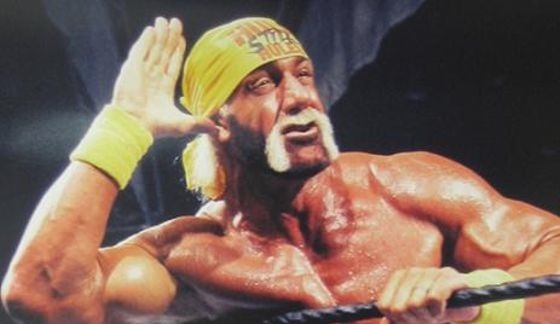 Am I disappointed over the circumstances surrounding Bill Cosby and Hulk Hogan? Of course. Do I dislike them now? Not at all. I’ll give myself a minute or two to lament or even mourn a fallen hero but that’s it. I have long come to terms with the fact that the public face may not necessarily be that real person. It’s like those Philippine celebrities who get voted to public office but are jailed for corruption or plunder yet deny everything even if they’ve been caught. Just because you play a wholesome person or a superhero on screen that doesn’t mean he or she is one. The problem is many people cannot separate fiction from reality. But Hogan is a fake athlete, you say. That is besides the point. He is a sports entertainer and millions and millions of people have hung on to his every word, taken their vitamins, and adopted his iconic poses and catch phrases. And that brings to mind that old Charles Barkley commercial about sports heroes NOT being role models. That certainly applies to entertainers or artists as well. Reality is a sick and jarring thud waiting to happen. Jordan was presented as the All-American superhero. Come on, he starred in a film with Bugs Bunny! Instead, he wasn’t the best teammate, he gambled, cheated on his wife, and well, cannot seem to get rid of that chip on his shoulder that he carried ever since he began playing. On the local front, there was this player I used to worship for quite some time, even if practically all of my family and friends rooted for opposing teams. When I found out years later the reason for his falling out with his teammates, I was crushed. And it isn’t anything like hearsay. I heard it straight from people involved. It left me shaking my head not only in dismay but in disbelief. How could you? There was silence and everyone around us heard it. A chill ran up my spine. If he stood up and left then everyone would be pissed at me. Mercifully, he didn’t (but he did hear what I said). I stepped down the dais and threw all three of my graphic novels in the trash bin. To this day, I do not read anything he writes. The excuse that we are only human is true but doesn’t let them off the hook. They are held to a higher standard. If they receive the admiration of many then scorn is no different. In this day and age of social media, it’s like the wrath of God has gone digital. This politically correct world has its pros and cons but what I do not like is how people are out to bury folks who committed wrong. People make mistakes. They should pay for them without a doubt but we shouldn’t excommunicate them where they cannot get back on their feet. Sometimes, people are crucified in public without the benefit of knowing the circumstances surrounding an incident. Case in point, that MRT commuter who was video taped arguing with a security guard. We only saw her outburst but not what preceded it. Who knows what the guard said or did to warrant that outburst for which the lady was bludgeoned? So are heroes or role models dead for me? Not at all. I have learned to confine my admiration to simply what they do in their field of excellence. Nothing more, nothing less. Color me jaded and I will somewhat disagree. Let’s just say that I learned to compartmentalize things better. Jordan remains a favorite athlete of mine. Hogan will always be one of my cherished wrestlers. I remain a fan of many people, bands, athletes, teams, but always keep my admiration at an arm’s length, sometimes even farther. There are far more urgent things that I should worry about such as work, family, and paying the bills rather get upset about someone whose 15 minutes of fame are up but had one mad minute for which they are now paying for their mistakes. The Mapua Cardinals defeated the Emilio Aguinaldo College Generals, 101-72, last Friday. While there is an obvious difference between the talent level of the two teams, I wanted to see how they attacked each other’s defense in terms of passing and if there is any consistency. Fewer passes, three or less, possibly but not at all times, indicate a fastbreaking style. Sometimes on the deliberate halfcourt set, the first pass it to the receiver who gives it to the first option who fires away. The idea is when you pass the ball around, you stretch the defense and find the open man. How accurate is the data? I’d say close to 90% as I was taking down volumes of notes. Legend: “Score” means a two-pointer, three-pointer, or free throw. And a “miss” covers all three as well except no score was made due to a miss or a blocked shot. A “TO” or “turnover” covers offensive fouls, errors, violations, jump balls. Take note that the numbers represent attempts not points. The Cardinals shot 51% from the field. During the first quarter, they tried to set up Allwell Oraeme rather unsuccessfully. They began to play better in the second period when Stephen Que found the range. By the third period, they began to run the break better allowing them to score on a lot of easy baskets. The Cardinals are a team that likes to walk it up if they can since they have a stud in Oraeme up front. Plus, they have the shooters to light it up and to spread that zone. The same cannot be said for EAC. Francis Munsayac is their best threat from the outside. Their best bet is to quicken the pace of the match as they have players who can run and finish the break in Munsayac, Christopher Mejos, and Sidney Onwubere. Look at those numbers – they scored 30x on three or fewer passes! How did they do this? They outrebounded MIT, 43-40, and that allowed them oft to get off the break. It is in their best interests to push up that ball quickly as opposed to walking it up. What’s the point of this? Let’s see if a team can be more efficient in running their offense if they know what their strengths are. Of course, we will try to gather more data about this for other NCAA matches. 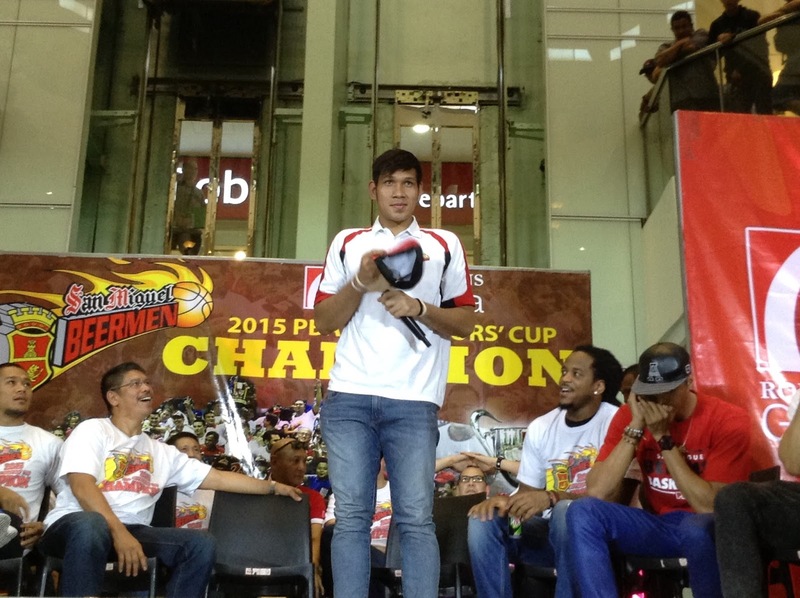 During the meet and greet with San Miguel Beermen fans yesterday at the Robinson's Galleria in Pasig City, head coach Leo Austria sat next to the Philippine Basketball Association's reigning back-to-back Most Valuable Player JuneMar Fajardo. When a fan was given a chance to ask Austria a question, she asked if Fajardo could continue his dominance in the league. "JuneMar," said Austria. "We haven't even seen his best." "I am not kidding. He can still do a lot more." Austria knows a thing or two about playing with top flight centers. During his playing days with Shell where he won Rookie of the Year honors, he won a title in 1990 with this bull-strong slotman by the name of Benjie Paras. When he began coaching in the old Philippine Basketball League with Welcoat, he had the good fortune of coaching Rommel Adducul who had to go the PBL route after the old Metropolitan Basketball Association folded. Adducul won four NCAA titles with San Sebastian before taking his act to the MBA. When he joined Welcoat, he teamed up with another pair of frontline studs in Eddie Laure and Marc Pingris to lead Welcoat to the title. At the start of his collegiate stint in 2006, Austria nearly made the UAAP Finals when he got a previously underachieving Ken Bono to raise his game several notches higher to lead the Adamson Falcons to the Final Four where they were stopped by a JC Intal-led Ateneo team. Bono took home the collegiate league's MVP plum but he later famously said he'd trade the award for a chance to win a UAAP title. While it is only with Adamson where he did not win a championship, Austria built a team that became a championship contender for many years. The team slid back into mediocrity when he left. The Falcons previously had to deal with infamy as they finished with a pair of winless seasons until Austria resurrected the squad. In his return to coaching in the PBA (after some seasons with Shell and Welcoat), Austria guided the Beermen to an Asean Basketball League title in 2013. The Beermen who were playing at that time in the PBA as Petron Blaze, put up a wholly different franchise to compete in regional basketball. Austria had Asi Taulava playing the five (he also handpicked current SMB third-string point guard Jeric Fortuna to run the one-spot) en route to a three-and-oh championship over the Indonesia Warriors. For his efforts, Taulava was feted the ABL's MVP Award that campaign. And now he has Fajardo and two PBA crowns. "I played as a shooting guard and it was easy for me to do my job because we had Benjie (Paras)," recalled Austria. "He opened the floor for myself, Ronnie Magsanoc, Calvin Tuadles and other perimeter shooters because he attracted double teams. Plus, Benjie could pass out of trouble." "I have always said that to be successful in basketball, it would be nice to have a center who can dominate because he will make life easier for everyone. JuneMar, I first saw when I was coaching Adamson and we were in the Philippine Collegiate Champions League," shared the coach of that first encounter with Fajardo who eventually became his player. "He was raw but the upside was obvious. That time, he would also shoot from the outside sometimes taking three pointers himself. While I know he can do that, we in San Miguel have plenty of outside shooters who are better than him. At the post, there isn't anyone we have who is better so as much as possible he plays close to the basket." "That too is the advice given to me by Lakay," noted Fajardo in reference to former Beerman star center Danny Ildefonso. "The close you are to the basket you can get easy points and lots of rebounds. You also give your teammates a chance to get open." "He is a thinking player. Very smart. And more importantly, very coachable," pronounced Austria. "I am excited to bring out the best in him and I think we haven't even seen JuneMar at his best." The San Miguel Beermen celebrated their 21st Philippine Basketball Association championship at the Robinson's Galleria yesterday with hundreds of their supporters. The Beermen were in full force this time around including back-to-back Most Valuable Player JuneMar Fajardo and import Arizona Reid. Fajardo wasn't available during their meet and greet with fans after they bagged the Philippine Cup to start the season. Fajardo who flew to Cebu following the series sweep over Alaska in the Governors' Cup returned for the team's fan and media commitments until Sundayafter which the team gets time off. During the Meet and Greet, fans got the opportunity to ask the Beermen questions and the two things that fans wanted to know was if there will be any changes to the line-up for next season and if they will go for the coveted Grand Slam. "We'd like to take it one game at a time, one conference at a time," gently intoned head coach Leo Austria in order to temper expectations. "It is getting harder to win a championship let alone three in a row in this league. Everyone improves their team by the conference. And no doubt they will be building their roster in the off-season." "Who doesn't want to achieve that goal," added Fajardo. "We all do. But right now we want to enjoy the offseason and not be burdened by basketball. We will get ready for that when the time comes and will give it our best." Austria said that on a scale of one to 10 with the latter being the highest, he would rate the chemistry of his team a "five." We got the job done but there is still much work to be done. We had many players injured sometimes all at the same time during many stages. One of our concerns is to keep this team and get them all healthy." 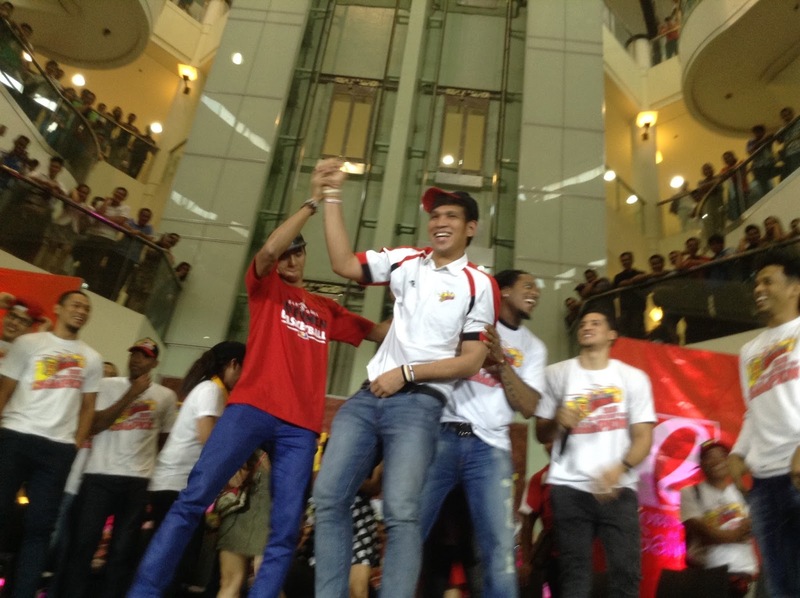 Power forward Arwind Santos led the Beermen in an impromptu conga line as they danced with fans on the stage. "This doesn't happen too often so we're going to do this with you (the fans)," said Santos to a cheering throng. Reid, who Austria was all praises for, was visibly moved by the reception he received from the fans. Pointing a sign that read: "Hard work = AZ Reid," the American reinforcement of the Beermen told fans, "That is what it is all about. You hear it all the time but that's the truth. You can't give up in the face of setbacks. If you look at San Miguel in the first conference, they were extended all the way to seven games. We could have lost that but we learned from it and took care of business in the Governors' Cup." "Ah, AZ," postulated Austria. "Was our x-factor." Liverpool's 2015-16 home kit ARE NOW AVAILABLE IN MANILA! Liverpool FC fans! The new home shirt with the New Balance logo will be available ethis weekend at New Balance stores at Alabang Town Center, Bonifacio High Street, SM Aura, and Glorietta. The home red will be selling at PhP 2,195.00. The white away kit will be available soon! 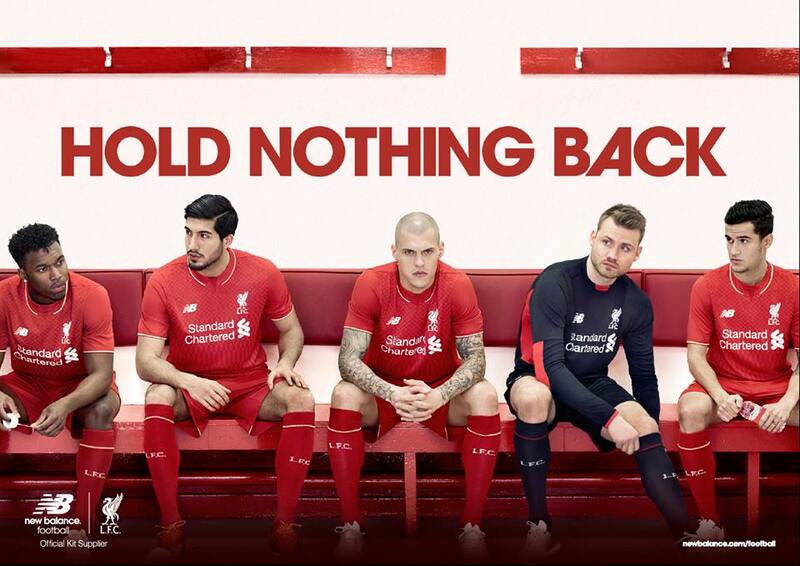 No word on the black third kit though. This appears in the Monday, July 20, 2015 edition of the Business Mirror. 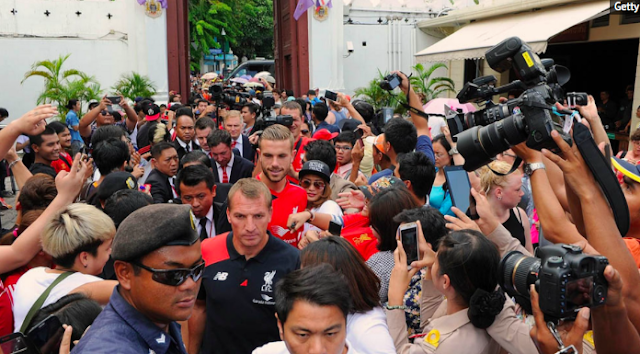 When Liverpool Football Club visited Thailand last July 12-14, it was the sixth time in the new millennium that the English club went to this part of the world. The trip was a hastily organized one as Kuala Lumpur and Macau were the previously announced cities for their Southeast Asia leg. However the deal for the latter fell through and Bangkok immediately agreed to host the Premier League squad. Why not? Thailand is home to the most number of Liverpool supporters in the world outside their native England. Through the graces of Standard Chartered Bank, the club’s global and official sponsor, I was able to attend many of the team’s functions in Bangkok from a press conference to clinics to interviews with its legends not to mention the friendly match itself. And it was as always a great experience even if the rains came crashing down. With the humidity obviously affecting the performance of Liverpool, a heavy rain came crashing down by halftime significantly cooling off not only the stadium but also Bangkok. The game picked up in intensity and skill after. While most of the media retreated to the covered confines of the Rajamangala Stadium, I stayed put in my seat taking in the rain with a few others. “Now that’s a real fan,” remarked Jet Namwong, a Thai Standard Chartered executive, to me as he went down to the media section to bring me over to the media room for the post-match press conference. Years ago, through my own initiative with the club, I was able to wrangle an interview with former manager Rafael Benitez in Singapore. During a club’s Kuala Lumpur sojourn in 2012, I was able to attend a function with players like Jamie Carragher and Andy Carroll. While trophies have become scarce in the last 20 years, Liverpool still enjoys incredible popularity among fans thanks to talismanic players in the last decade like Michael Owen, Steven Gerrard, Fernando Torres, and Luis Suarez to name a few. And they have been the first club to embrace its fan base outside England having made regular tours to North America, Australia, Europe, and Southeast Asia in that span. And since the significant inroads made by Liverpool in emerging markets and increasing its fanbase, other clubs, not only from England but also Spain and France have also gone on tour. As usual, I did a survey among fans in attendance and not only were there fans from Thailand but also from (not in particular order) Vietnam, Singapore, the Philippines, Malaysia, Australia, Bangladesh, Indonesia, and Hong Kong. During my first ever trip to Anfield, Liverpool’s home field, last September 2014, I met fans who flew all the way from South Africa, India, Germany, the Netherlands, and from other parts of England. It was incredible not only for the experience but also for connecting with others who made their pilgrimage. A survey on LFC’s Facebook page last November of 2014 about fan engagement depicted some surprising results and there are a lot of things to glean from it. Digressing for a moment, in the Philippines, there are a lot of fans of the club but there is no official count as no supporters club is not yet recognized by Liverpool FC. Hopefully, it will be soon! But some notable fans include past and present Azkals like Chad Gould, Rob Gier, Chieffy Caligdong, and national team manager, Dan Palami. Back to the survey, three of those countries are from Southeast Asia and they are in the Top Five. Five are from the Asian region if you include India and Egypt. Of the 10, only two, India and the USA, aren’t considered football mad-countries although they are viewed as emerging markets. Six countries have played in the FIFA World Cup — UK (as England), Egypt, Turkey, Mexico, Brazil, and the USA. While Turkey has no official state religion, about 96% of its population is Muslim. And thus, four countries on the list are Muslim including Indonesia, Malaysia, and Egypt. It is incredible to see a LFC fan base in Mexico and Brazil where the sport is a religion. If you are to ask what is the most popular football side in Mexico you’d be hard-pressed to guess who it would be. For Brazil, one can drop Santos FC’s name on account of Pele and Neymar but it is actually Flamengo. Liverpool’s popularity in Brazil and other parts of the world is a testament to the draw of the English Premier League. It should be noted that during the 1950 World Cup Final between Brazil and Uruguay, close to 200,000 people packed the Maracaña Stadium in Rio de Janeiro. But that is national fervor in a hotbed of a region of rivalries. When Liverpool played the Melbourne Victory in Australia two years ago, 95,000 Aussies packed the venue! That is quite a draw possibly the single biggest number to see a LFC match. In a 2013 survey by Bleacher Report, they cited Liverpool as the seventh most influential football club in the world (once upon a time where trophies were a regular acquisition at Anfield they were number one). Surprised at the “small” number from the UK? You shouldn’t be. For fans who live outside the UK, Facebook and social media is the most convenient way for them to express themselves or try and be a part of the action. Fans in the UK have a different way of expressing themselves by going to the matches and pubs, or by purchasing the merchandise or fanzines sold around the stadium. I have been a fan since 1979 and have seen the club seven times live across three continents — North America, Asia, and Europe. I have over three dozen Liverpool kits, a number of scarves, magazines, and other merchandise. But I do not engage all the time on social media as I do have quite a lot of other things to do. And so it is with LFC in Bangkok. It was fun and memorable but I also wish that we in the Philippines — especially for my fellow Reds fans — had a taste of this. When I informed former LFC star Luis Garcia that the side had fans in the Philippines, he looked pleasantly surprised. When I asked if it was possible he could come down over to the Philippines, he answered, “Why not? I never thought I’d be down here in Bangkok or Asia as a Liverpool ambassador. It is good to be associated with this historic and famous club."